(R.R.P £299.99). 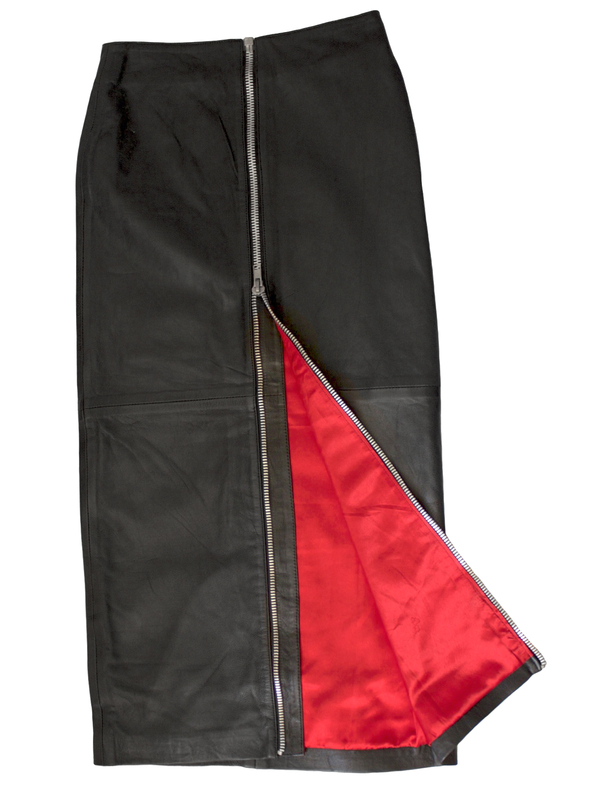 A black leather maxi skirt with a chunky full length silver metal front zip that opens fully from the bottom upwards. Why not wear this open it a little to show your legs and the beautiful red satin lining? Tailored in luxury soft lambskin nappa leather, sourced from British hides, it is styled to be figure-hugging. Ideal for any smart/casual occasion. Length (waist to hem): 35in-37in/89cm-94cm, depending on size. Made exclusively for the Tout Ensemble label by Ashwood to our own design. NOTE: This same style is also available in other lengths: Extra short mini (12in); Standard Mini (15in); Above-Knee (19in); Knee Length (23in); Below Knee Midi 27in; Mid-Calf Midi (31in). A leather maxi skirt with full front zip is exquisitely tailored in fine quality luxury soft black lambskin nappa leather. The full length silver metal zip at the front opens fully – to wear, simply wrap the skirt around you and close the zip from the top downwards. And of course, you can leave it open a little to be more revealing – let it fall open as you walk or as you sit to show off your legs and the beautiful red satin lining. This leather maxi skirt sits at the waist and is styled to be close-fitting to hug the figure. Made exclusively for Tout Ensemble by Ashwood to our own design. This is a close-fitting style! Because UK sizing is inconsistent between stores on the High Street, we have given WAIST and HIP measurements for each size. We want to help you get the right size first time. After you have measured yourself (see below), please choose the corresponding waist/hip size from the drop-down box. Please do not estimate your measurements & please do not measure another article of clothing from your wardrobe. Our Sizing Information also gives more details. (RRP £279.99). A very elegant suede leather midi pencil skirt in luxury soft pale tan suede, perfect for smart wear, with a long back split/vent for added style and easier movement. It is a below knee midi length (around 26in), finely tailored to be close-fitting, sitting on the waist and following the curvature of the body to flatter your figure. Fully lined. By Ashwood. Please see our Product Description below for full details and important sizing information. (RRP £259.99). A beautiful leather pencil midi skirt for smart wear, made in fine quality smooth and soft lambskin nappa. It reaches below the knee (26in length) and features a 12in vent at the back. It sits on the waist and is a close-fitting style to emphasise your shape. Made by Ashwood. Please read our Product Description below for full details and important sizing information.